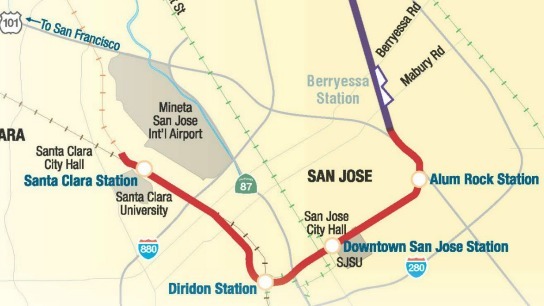 There are more than a dozen major construction projects going on in Downtown San Jose and VTA’s BART Silicon Valley Extension Phase 2 is one of them. On October 30, from 6 pm – 7:30 pm, at San Jose City Hall, there will be an opportunity to learn and ask questions about work on the Phase II project as well as the other downtown construction undertakings. In contrast to prior years where each group did a short presentation on specific projects, this year’s format is Open House-style where each group will have a table and people can browse the room. It’s an opportunity to speak more in-depth with project leaders and get answers to specific questions. VTA staff will be on hand to provide information and answer questions about BART Phase II, particularly the geotechnical investigation work that is taking place downtown and in the Diridon Station area. We’ll have fact sheets, maps, construction notices, and other information available. Other upcoming VTA projects within the downtown core that we’ll be able to speak to include installation of a barrier at 2nd Street as part of the Light Rail Speed and Safety project, and a significant rail rehab project involving the overhead wires at Santa Clara, St. James, and Paseo de San Antonio, both scheduled for early 2019.